Contractual employees of Pepsi Cola Products Philippines, Inc. (PCPPI) complained that since June 11, production operations have been halted and they have not been called to work. The said move of the PCPPI came immediately after the shutdown of its six deep-well pumps inside its factory in Tunasan, Muntinlupa City. The said deep-well serves as the soda plant’s water source. Defend Job Philippines airs condemned the move of Pepsi Cola Products Philippines, Inc. (PCPPI) to not allow more than 1,000 contractual workers from working since Monday. 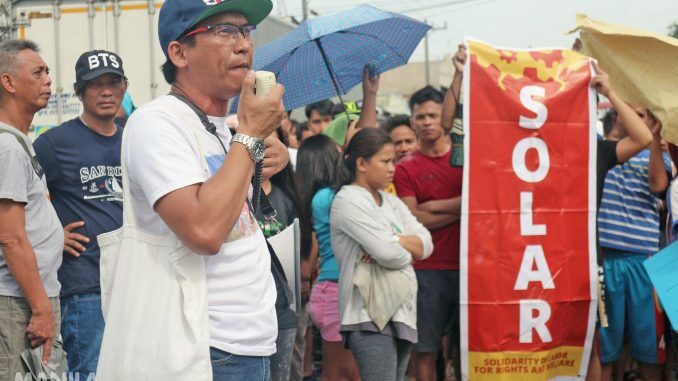 Defend Job Philippines and the Solidarity of Labor for Rights and Welfare (SOLAR) cast doubts on the “deep-well mess” that is being used by the PCPPI as reason why contractual workers were not being called to work. The two labor groups also bemoaned the move to be part of the implementation “Project Genesis” or the long-standing plan of the PCPPI to close its Muntinlupa plant and to abolish the existing workers union in the company, the Pepsi Cola Labor Union (PCLU). Contractual workers held a picket in front of the Muntinlupa soda plant at 3pm on June 14. They have been out of work for four days. Laid off contractual workers held a protest oustide the Pepsi Cola plant in Muntinlupa. “We support all of the contractual workers of PCPPI in their assertion for the basic right to work and for decent and regular employment. It is just and legitimate for them to take up all necessary form of actions to advance and struggle out these demands,” said Defend Job Philippines in a statement. They also challenged Department of Labor and Employment Secretary Silvestre Bello III and Philippine President Rodrigo Road Duterte to intervene on the issue. Duterte was known to have made a campaign promise to end contractualization within a year of his presidency. The president issued an executive order (EO) on Labor Day, May 1, to end contractualization. Labor groups dismissed the EO as ‘nothing new’ or ‘without effect’ as it contained provisions already found in the Philippine Constitution and the Labor Code. While labor groups in the country observed much needs to be done in the delivery of the promise, the administration last verbalized its continuing commitment to end contractualization in the country. The post Worker groups decry 1,000 Pepsi contractual workers’ lay-off appeared first on Manila Today.